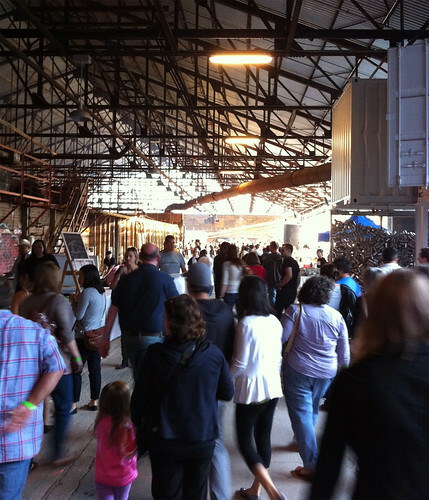 Inspired by the San Francisco Underground Market, TUM touts itself as a "social food market." It's meant to bring people who love and appreciate food to come together and see what home chefs are doing in their own kitchen. These may not be professional chefs, but they still had to go through an audition process in order to be selected to participate in TUM. So it's a mixed bag—some home chefs and some who cook for a living (there were a lot of various catering companies there). For the inaugural event, there were 25 vendors participating, along with 4 breweries and 1 winery. It cost $5 for entrance, and dishes would range from $3-8 each. 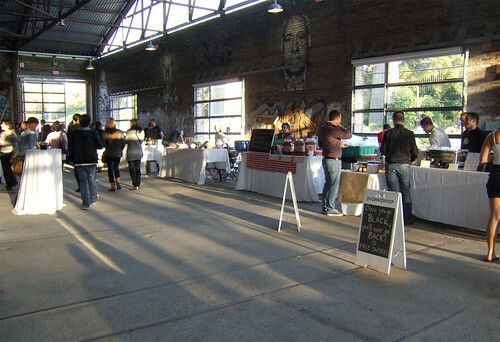 The event was held at the beautiful Evergreen Brick Works, where vendors can also have access to the commercial kitchen on-site. Like so many others when the doors opened, I made a bee-line to La Carnita. 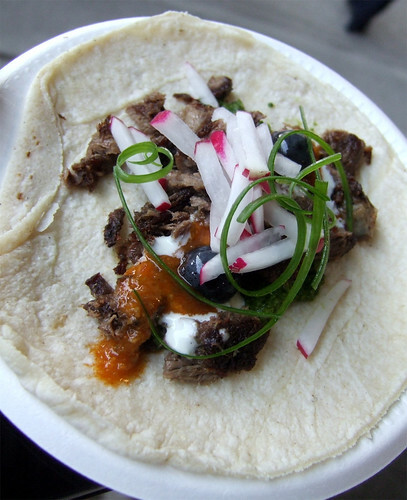 Working so far away from downtown, I can never have the pleasure in partaking in their pop-up lunches, so I can only get my taco fix when La Carnita shows up for events such as TUM or Food Truck Eats. I was delighted to find the beef tongue tacos on the menu. It's a gorgeous creation, with the radish, grapes, cilantro pesto and Rossy's famous diablo de fuego hot sauce sitting pretty on top. So. Good. 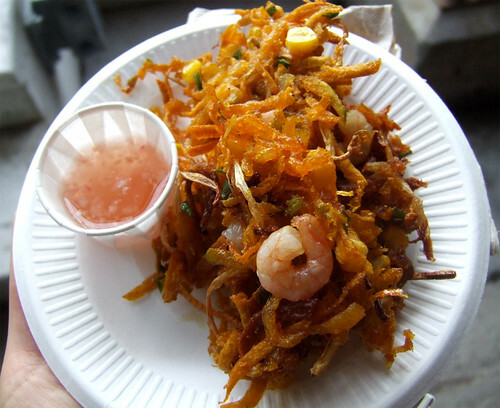 There were a few vendors selling filipino food and I got myself some ukoy—shrimp fritters—from Tita Flips. The colour on these were beautiful thanks to the squash and pumpkin in them. I wished they were crispier, but there was only so much they could do when deep-frying in hot oil over portable gas stoves. Their oil would never stay constant enough to get them super crispy, and they made the best of what they had. Another favourite item of the night for me were the fried egg and bacon dumplings. They don't sound or look particularly exciting but one bite into them and you're proven wrong. 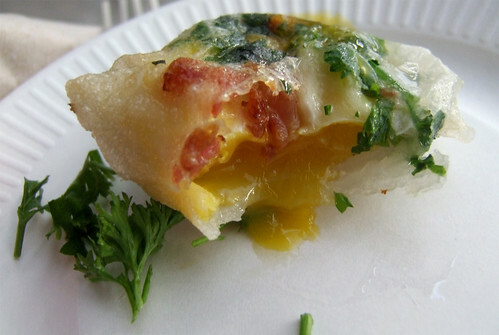 The name says it all—bacon bits and an egg yolk encased in a wrapper and steam-fried. The egg yolk is still runny inside, and the wrapper has a nice touch of crispiness. I would love to have a big plate of these for breakfast. There were a lot of sandwiches being served at TUM, in one form or another—beef sliders, pork belly sandwiches, cornbread grilled cheese and more. 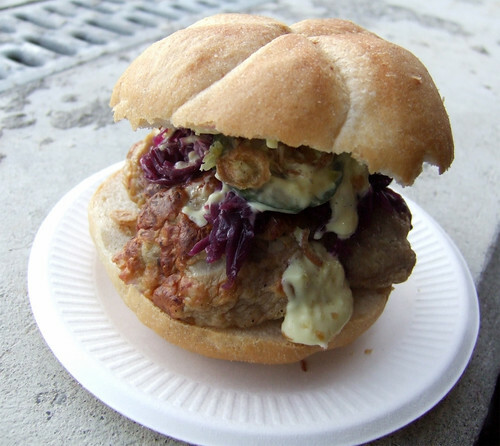 The sandwich that caught my eye was the Frikadeller from AdventureFood. It was a monstrosity of a sandwich stuffed high with Danish pork meatballs, duck-fat braised red cabbage, remoulade, crispy onions, and homemade pickles. I ended up just eating all of the sandwich filling and none of the bread. I was a little hesitant when I got the sandwich as there were a lot of things going on, but they did all work nicely together. I did find the cabbage a bit on the sweet side, but the pickles were incredible. Wish I could have taken home a jar of those. A few other dishes were had but I was tapped out after trying about 8 different things. A much like events like Food Truck Eats, line-ups quickly grew and food started to get sold out as the evening wore on. A huge congratulations to Hassel Aviles, the organizer of this event. A lot of time and energy must of gone into the planning of this (which must not have been easy at times), and for an inaugural event, it went pretty well. The first event quickly sold out of its 1200 tickets, and with more vendors expected at the next one in October and as word-of-mouth spreads, this event will only get bigger and better. 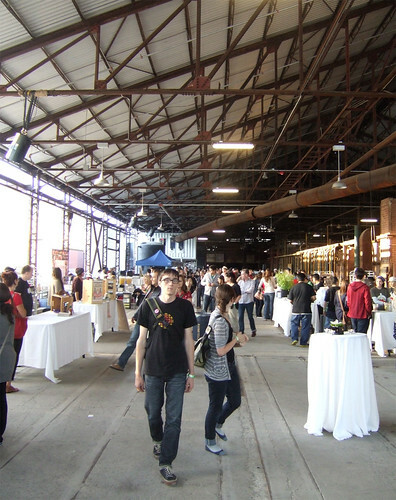 The next event is happening Saturday, October 22 at the Evergreen Brick Works, and tickets are on sale today. This is a 19+ event. Get your tickets quickly, as they will sell out fast! And check out my full photo set from TUM. Anonymous September 26, 2011 at 5:23 p.m.
Great post! How much was the Frikadeller? It looks amazing! Felipe Siem September 26, 2011 at 8:52 p.m.
that's a cool picture of the egg dumpling! Bonita September 26, 2011 at 10:44 p.m.
Robin - I think the Frikadeller was $5. Great value and pretty tasty. Mardi @eatlivetravelwrite September 27, 2011 at 2:35 p.m.
OMG those dumplings :) I missed this one - was supposed to be out of town then plans fell through and I missed out on this and Stratford, but I already have tickets for the next one. Your photos make me happy I do! Neil October 3, 2011 at 11:52 a.m.
How do they get the egg in the dumpling to still be runny? That's almost like getting the caramel into the chocolate bar!